He was born in Meshashambul village of Balakan region on February 15, 1969. In 1986 he finished secondary school in the village of Mesheshampul. In 1987, was called up for military service from the Military Commissariat of Balakan. Ramadan held military service in Afghanistan. He took part in military operations in Afghanistan and for his gallantry was awarded the Honorary Title of the Presidium of the Supreme Soviet Board of the USSR and the badge of "International fighters" for also taking an active part in the international part of the army. In 1989, Chirinov Ramazan was discharged from the army and he began his career as a policeman in the Internal Police Department of Balakan. At that time, every day they were enraged by the armenian separatists in Karabakh. As a police officer, he repeatedly took part in operations, in defense of our lands and was sent to Karabakh. In 1995 in Balakan region a criminal group was arrested and neutralized and Chringov Ramazan showed a true example of heroism during the operations. He timely prevented smugglers from trying to cross the borders but unfortunately our brave police sergeant died heroically while fulfilling his duties on 3 September 1995. 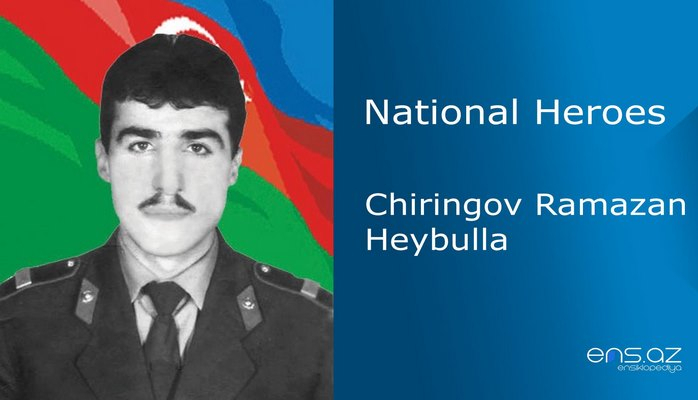 Chringov Ramazan Heybulla was posthumously awarded the title of "National Hero of Azerbaijan" by the decree no. 424 of the president of the Azerbaijan Republic dated 1995 December 26. He was buried in the village of Mesheshampul. One of the streets in Balakan city is named after him.